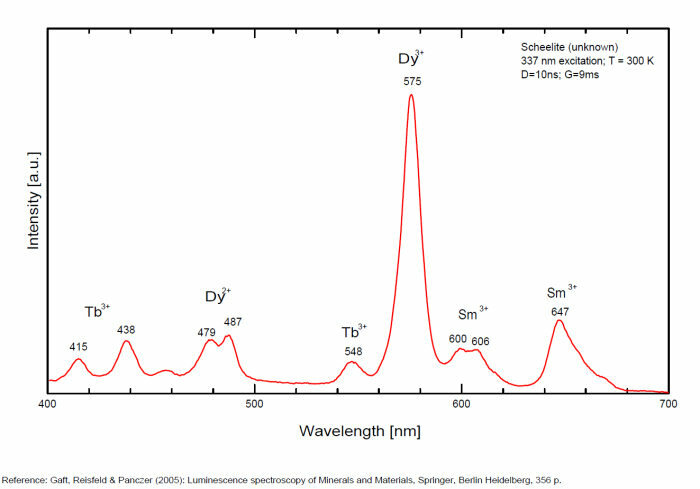 Peaks in relation with the presence of REE: 488 et 575 (Dy3+), 609 et 647 (Sm3+), 439 (Tb3+) et 607 (Pr3+); the pegmatitic and hydrothermel scheelite shows the lines of Erbium and Terbium, while scheelite occurences related to eruptive complexe and sulfide ore shows dominantly the lines of the REE of the Cerium group. Green emission due to (MoO4)2-(Tarashchan) or possibly Pb (Blasse). 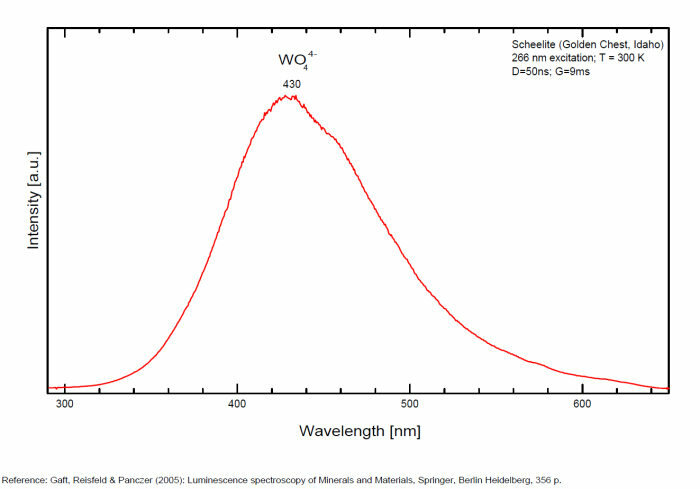 The natural photoluminescence emission of ordered CaWO4 is attributed to an intrinsic slight distortion of the [WO4] tetrahedral. 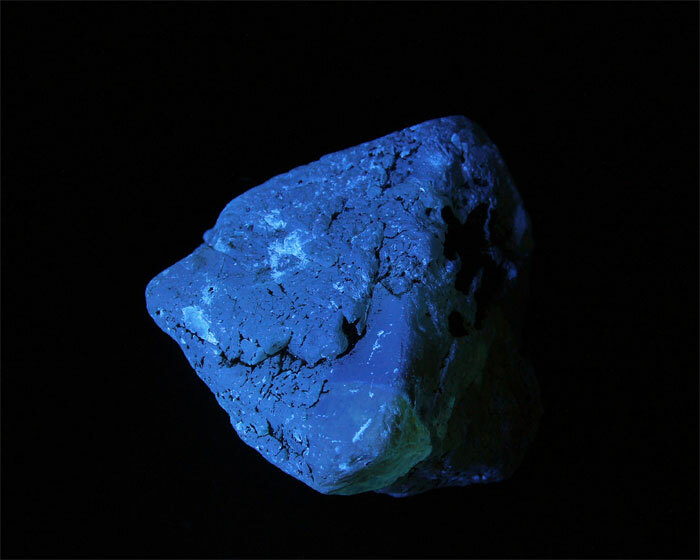 The color of the fluorescence of scheelite gives an idea of the unwilled presence of molybdenium in the ore. 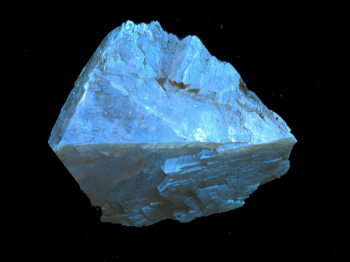 Concentrate of scheelite not penalized for molybdenium have a distinct blue fluorescence color. 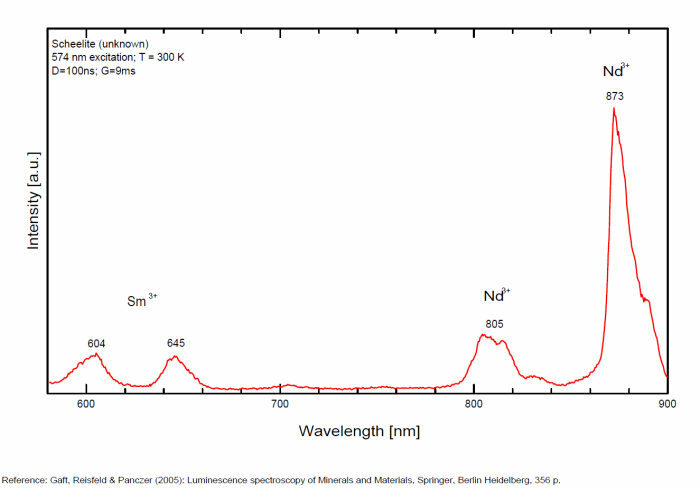 Those that fluoresce white are borderline and contain roughly 0,35% to 1% of Mo. 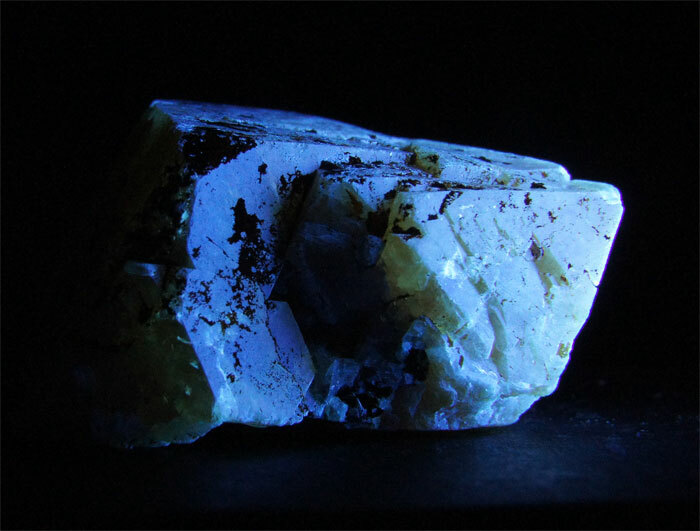 And scheelite that fluoresces distinctly yellow contains more than 1% corresponding to a transition to powellite. 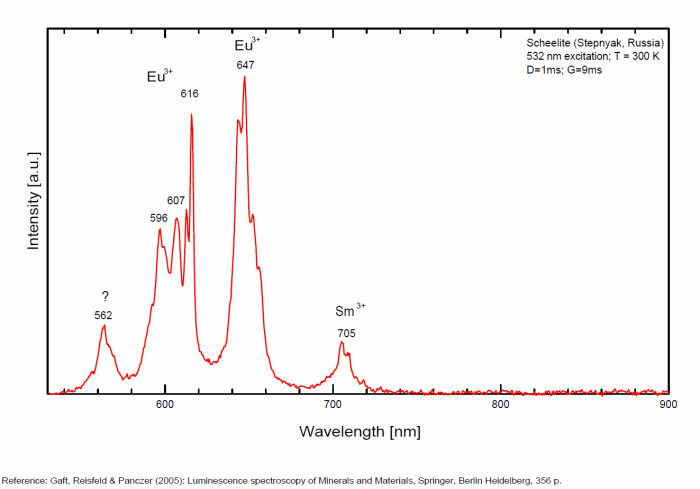 Higher than 4,8%, the yellow fluorescence color stays unchanged and cannot anymore be used as an indication of the percentage of Mo. Using this property, a method was developped by R.S. Canon jr. (1942) while studying tungsten deposits in the seven Devils mining district of Idaho. 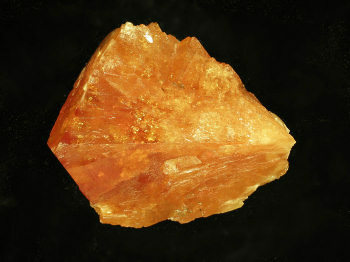 A serie of finely powdered synthetic preparation or natural ore of known composition are permanently mounted in circular areas on a black card, being placed in order of increasing molybdenium content. There are twelve standard values on the card: 0,05, 0,19, 0,33, 0,48, 0,72, 0,96, 1,4, 2,4, 3,4, and 4,8% plus a pure calcium molybdate (48% Mo). Alternating with the covered circle are circular holes of the same size. 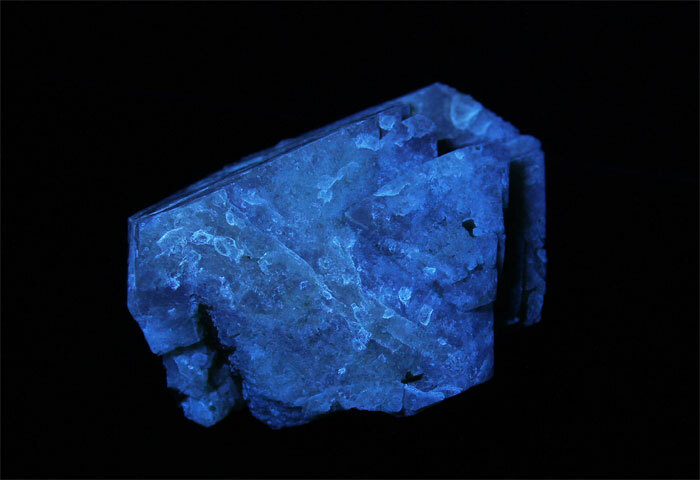 The card is used by placing a hole over a powdered sample of the scheelite ore to be tested and comparing the fluorescence color of the sample with those of the adjacent standards. 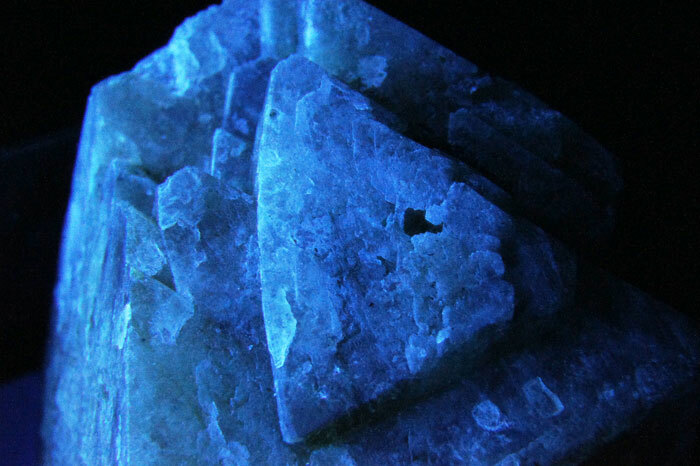 The sample will be found to have a fluorescence color according or between two standards and hence the approximate composition could be defined. 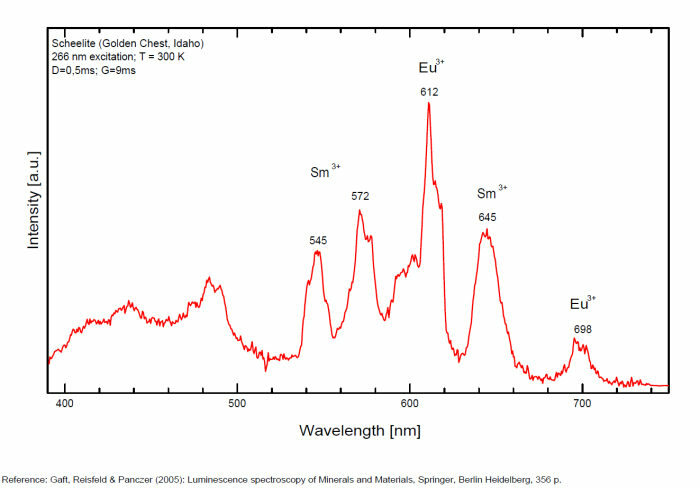 Scheelite incorporates also tens to thousands of ppm RRE in substitution for Ca giving sometimes typical peaks in the fluorescence spectrum.